BAGHDAD, Iraq (CNN) -- Iraqi Prime Minister Nuri al-Maliki's coalition won most of the provinces in last week's local elections, and an underdog prevailed in Anbar, the largely Sunni Arab province, election officials said Thursday. 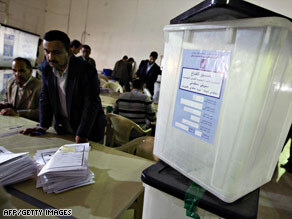 Provincial election ballots are sorted during a tally Thursday in Baghdad, Iraq. Officials unveiled the results of 90 percent of returns from Saturday's elections. The other 10 percent -- as yet uncounted -- comprise special voters, such as security forces who voted before last week's election, and contested ballots. The vote was viewed as a test of the popularity of al-Maliki, a Shiite who has emerged as a powerful politician. Al-Maliki's State of the Law Coalition list -- which includes members of his Dawa party -- came in first in nine of 14 provinces. The prime minister's list won 38 percent in Baghdad province, the most populous in Iraq, and won in every province but one in the Shiite heartland. The coalition won 37 percent in oil-rich Basra and 16.2 percent in Najaf, an important religious region. His list also won in Babil, Muthanna, Maysan, Thiqar, Qadisiya and Wasit. The al-Maliki coalition came in third in Karbala, where a candidate named Yousif al-Haboobi won. Reidar Visser, a research fellow at the Norwegian Institute of International Affairs and an authority on the Shiites in Iraq, published a paper Thursday saying al-Maliki's rise was "spectacular." He called the election a rejection of the "sectarian identity politics" of the Islamic Supreme Council of Iraq, which emphasized "sectarian Shiism" and favored federal region ideas. "Maliki and his Dawa party are big winners everywhere and particularly so in the big cities of Basra and Baghdad," Visser said. By contrast, the Islamic Supreme Council of Iraq "has been decimated across the country." Sadrists surpassed the party in Baghdad and Maysan as well. In the volatile region of Anbar, where Iraqi troops are on the alert for any election-related violence, the list headed by Sunni politician Saleh al-Mutlaq sneaked in with 17.6 percent of the vote. It edged out the Awakening movement, which received 17.1 percent , and the powerful Sunni Arab Iraqi Islamic Party, which got 15.9 percent. Al-Mutlaq's showing is something of a sleeper; he is head of the Iraqi Front for National Dialogue, which has 11 seats in Iraq's parliament. In the largely Sunni Salaheddin province in the north, the Iraqi Islamic Party prevailed as well with 14.5 percent, and the secular list headed by former Prime Minister Ayad Allawi came in second. The Iraqi Islamic Party also took the diverse northeastern province of Diyala, with 21.1 percent of the vote, and the Kurdish Alliance took 17 percent there, one of the few provinces where Kurds turned out. The four provinces that didn't have votes on Saturday included the three Kurdish provinces in Iraq's Kurdistan Regional Government that will hold polls in May, and Tameem, where political disputes in Kirkuk among Kurds, Arabs, Turkmens and Christians have led to a delay in elections. In Nineveh, which has a strong Sunni Arab, Kurdish and Christian presence, a Sunni Arab list called al-Hadba'a won 48.8 percent. Visser said al-Maliki's "increasing appeal to Sunnis, while often acknowledged by Iraqi Sunnis themselves, is not convincingly reflected in the results." His coalition didn't run in Anbar, got 3 percent of the vote in Salaheddin and even less in Nineveh. But Visser said al-Maliki's victory has implications for national Iraqi politics because of the power that the Islamic Supreme Council of Iraq and the Kurdish Alliance have wielded in Iraq's parliament. "It is high time that Western politicians realize that the party they have been considering as the key to Iraq's Shiite community (and sometimes have singled out as the likely provider of the next Iraqi premier) actually commands less than 10 percent support in the constituency it purports to represent," Visser said. "In other words, for much of the period since 2003, America's policy in Iraq has probably not enjoyed the support of more than 25 percent of the country's politicians [the two Kurdish parties and the Islamic Supreme Council of Iraq]," Visser said. There was violence in Iraq on Thursday. In Baghdad, one of the 4,000 female candidates who ran in the elections was fired on but escaped unharmed, an Iraqi Interior Ministry official said. A roadside bomb exploded in central Baghdad, and Deputy Education Minister Nihad al-Jubouri escaped unharmed, the Interior Ministry official said. One civilian was wounded. Last week, the undersecretary of the Ministry of Higher Education escaped an attack on his convoy in Baghdad. A suicide bomber killed at least 14 people in the Kurdish town of Khanaqin in Diyala province. In a village near Khalis, also in Diyala, six decapitated bodies were found Wednesday, the official said. Also Thursday, the U.S. military confirmed that a child and the child's uncle were killed when an American armored vehicle struck a pickup this week in the northern city of Mosul, an incident described as an accident. The U.S. vehicle was part of a convoy responding to an attack on a joint coalition-Iraqi patrol, said Maj. Derrick Cheng, a spokesman for Multi National Division-North. CNN's Jomana Karadsheh and Joe Sterling contributed to this report.